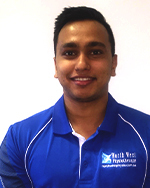 Following completion of his Physiotherapy degree, Ron immediately joined the North West team in 2016. Ron brings with him a wealth of knowledge and experience across the musculoskeletal, paediatrics, sports and orthopaedic/surgical streams of Physiotherapy. Ron has worked with a variety of high-level sporting teams including Mitchelton Football Club, Souths United F.C., Norths Rugby Union and the First XI & First XV at St. Joseph’s Nudgee College. Additionally, Ron was selected as part of the Medical Team for the 2018 Gold Coast Commonwealth Games. Ron has particular interest in treating acute and chronic back pain, preventing/treating sports injuries and post-surgical rehabilitation. Furthermore, Ron has additional training in Western Acupuncture/Dry Needling, Strength & Conditioning and shoulder rehabilitation. Ron is also the Everton Park Hydrotherapy Instructor.